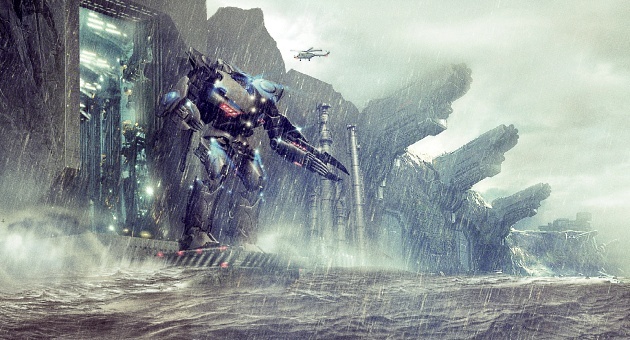 Normal Banners Aren't Big Enough For PACIFIC RIM. Here at ScreenAnarchy we tend not to put up each and every movie poster on the main page. Pretty ones that catch our eyes are generally posted on our Facebook page, but there are of course always exceptions. 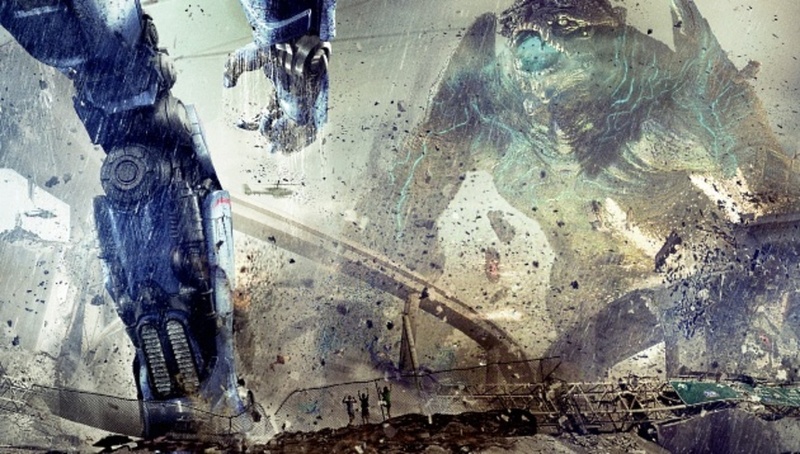 Case in point: the poster campaign so far for Pacific Rim, Guillermo Del Toro's upcoming giant monsters versus giant robots flick. We haven't run every single one of their robot posters, but we made sure we put them all up on Facebook because they have all been, without fail, awesome. The latest one Warner Brothers released last week beats all of them into a pulp. And it's a hard one to publish, actually, as it has a weird format. They call it the "Superbanner" and you can download it here, to try and print it out yourself. Warning: try to print this at your office and you might get fired, as this baby will eat a paint cartridge or two, when printed at its intended size. The download image has a size of 14,543 x 1024 pixels, meaning you'd need eight HD televisions side-by-side to watch all of the banner. The bits shown at the top and bottom here are exactly that: tiny bits of it. Go here, click "menu", click "in-theater super banner". "No way can the story live up to the one my inner 12-year-old is making up while watching this... "
Too true, you just know they are gonna bung it up somehow. IMO, I think Hunnam is/was a terrible choice, his acting skills are questionable (unless you are into overacting) but we'll just have to wait and see. To me, all those kaiju movies were about a specific art form that is maybe being lost. They were about the technical expertise necessary to miniaturize the environment to a point where a man in a suit looked like a giant. They were about meticulous model-making and strategically forced perspectives. There seems to be nothing about this supposed homage that relates to that at all. That said, I still think it might be an excellent movie. It's just not getting anywhere with me by pretending to nostalgia. This is, quite intrinsically, a completely different thing. You are absolutely right (and thanks for the excellent example). Instead of "maybe being lost," perhaps I should have said "certainly on the run." There will always be some old scholars keeping the faith, I hope. making up while watching this..."
I've seen a screening of this and it's absolutely unlike anything else out there, young teens will absolutely adore it and adults will be transformed into young teens and they will adore it as well. It's a very special surprise you guys are in for.